Welcome to the second in my series about Skill Challenges (specifically in Dungeons & Dragons, but probably applicable to other systems as well). You might want to read my first post, How to Fail at Skill Challenges, before this one. Before I write several more posts about using skills in roleplaying games (and specifically D&D), let’s ask an important philosophical question – why do we even make skill rolls? We make combat rolls to find out what happens when the fighter tries to put a sword through an orc. A high roll means the orc is hurt. A low roll might miss. These rolls drive the story of the combat, but… really, don’t we know the outcome of most combats? Usually, the PCs win. But no one suggests we do away with the rolling – the rolling is fun! So when we approach skill rolls and scenes where skill rolls drive the story, could we just do away with the rolls? In a social scene, can’t the players just roleplay with the NPCs and the Dungeon Master can decide how well they talk? If the PCs want to search for secret doors, can’t the DM just insist they say which squares they search and how? If there’s a puzzle to solve, can’t the DM just make the PCs solve the puzzle? Sure. But is that fun? Doesn’t it cheat classes like Bard and Rogue out of a chance to use their stats to their full effect? And moreover, isn’t it unfair to force an introverted player roleplay their charming or extroverted character when the player just isn’t as good at talking and conniving as their character should be? We roll because it’s fun. But, as I pointed out in the first post, if the DM lets a single die roll decide a whole scene or story, then it’s no fun. There must be a better way to use skills in the game. Here are a few ideas! Adventurer’s at a social event? It doesn’t sound like a good idea for people who solve most of their problems with swords and fireballs. How do we turn this into a fun opportunity for roleplay and a chance for characters who took Persuasion and Deception to use those skills in more than a single roll? If the PCs are carousing, or they have to convince a noble of something, or befriend a king, or surreptitiously find out the secrets of the court, why not run it like a combat? Let the players roll their Persuasion, Deception, Intimidation, Insight, History, and other skills as if they were attacks, and let them accumulate points based on their ability score bonuses, perhaps with die rolls. Instead of “damage,” you can have the NPCs make their own rolls to find out information from the PCs, or perhaps to draw favors from the PCs in exchange during the conversation. Example: Fargin the Fighter chats up the baron’s aunt, and rolls a Persuasion check of 15. The DM decides that’s a “social hit,” and has Fargin’s player roll 1d6 plus his Charisma modifier. The DM records the total, and decides the players succeed when they accumulate a certain number of points. While socializing, though, some NPCs might find out juicy tidbits about the PCs, or corner them into promising favors to the NPCs. Ugh. Secret doors. They’re a cool part of the lore of dungeons and the secretive treasure rooms of liches, but… without a full rendering of the dungeon walls for players to inspect, doesn’t finding a secret door come down to a lengthy description of how the PCs procedurally probe every corner of a stone room? Or, worse yet, doesn’t it come down to a single die roll? And wasn’t it me who said things like that shouldn’t come down to a single die roll? Exactly. First, you could make it so the party finds the secret door no matter what (especially if they need to find it in order to advance the story), but allow the rolls to determine what’s waiting for them on the other side. If it’s a monster, maybe a failed roll means it has a few more hit points, or a bonus to hit. If it’s treasure, maybe a failed roll means there’s less of it. As a default approach, this is over-simplistic. I say let the players describe how they search the dungeon if they enjoy talking about how they search the dungeon. Let them make multiple rolls if they are investigative types. But ultimately, if they find such things dull and pointless, it might be best to let them roll, describe how they find what they find, and then append consequences if their search rolls were awful. There are better solutions for finding secret doors and things like that, but I’ll talk more about that in a future post on this topic. For puzzles, if the players are truly stumped, a DM might want to give hints based on skills like History, Arcana, or Nature, or possibly just a Wisdom or Intelligence check with proficiency for those with the right background. In this way, you can combine die rolls with some out-of-character puzzle-solving skills, giving the players a bonus for their skill proficiencies, but not giving away the whole ball game on a single Intelligence check. But note that this is only really necessary if the puzzle is stopping the PCs from proceeding. If they puzzle opens the door to the treasure, then give hints. But remember, “puzzles” can also be hints about what monster lies deeper in the dungeon, or a way for them to more easily dispatch the monster or get through a hazardous room. I don’t know why dungeon keepers do this, aside from perhaps to entertain themselves as adventurers run headlong into their traps and monsters. I’m looking at you, Acererak! Remember, rolling is fun. It’s the triumph of the 20; it’s the despair of the 1. Players expect those die rolls to have consequences, but they don’t expect those consequences to be career-ending for their character. Make sure all the rolls in your game are fun by making sure they move the story forward and carry both benefits and consequences for the PCs that are meaningful and appropriate. 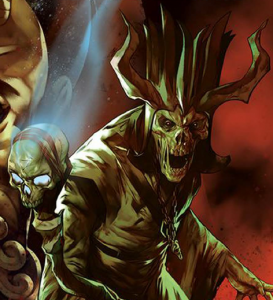 The Dungeon Master’s Guide encourages you to make the game your own, but you can still feel chained to what’s between its covers. But don’t be afraid to stretch things out – if the “social encounter with rolls like combat” sounds exciting, flesh it out for your game! Adding mechanics to the game can be a lot of fun, but it’s best to use mechanics your players are already familiar with. So get out there and roll those skill checks! Sure, we could play the game without skill rolls, but we’re playing D&D because we like rolling those d20s! And most importantly, stay tuned for more articles on Save Vs. Blog about how to do skill rolls and skill challenges more better! This post isn’t just about D&D, nor is about a single edition of D&D. This is really about how to handle scenes where a single skill check (of whatever variety) can make or break a whole story, adventure, or campaign. We’ve all been there before – the PCs are racing through a dungeon, on the run from hundreds of orcs, and they come to a dangerous room where they have to make an Athletics or Acrobatics checks… or else fall to their doom. And if you’ve never been there before… maybe you’ve seen The Fellowship of the Ring? 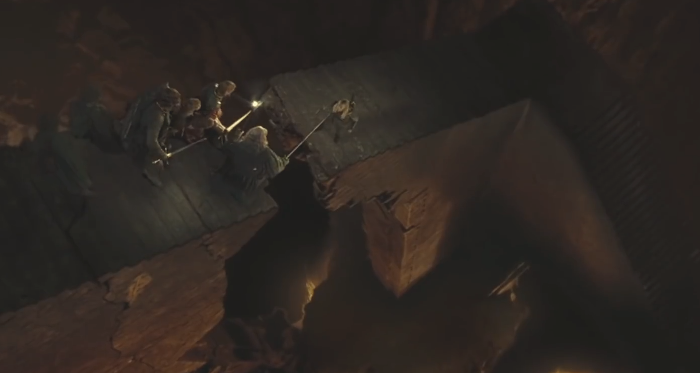 So imagine that the Dungeon Master of the Lord of the Rings campaign puts his players in this situation, and then has Gimli’s player roll an Athletics check to jump across the gap… but Gimli fails the roll. What does the DM do? Does he drop Gimli to his death from falling damage? Instant death seems like a strong consequence of a failed skill check. But if Gimli makes the jump despite failing the roll, why have the roll in the first place? There has to be meaning behind the roll, but not so much meaning that it determines whether a PC lives or dies. How does a Dungeon Master handle this? Well, first, let’s think about it purely in terms of 5th Edition Dungeons & Dragons mechanics. What are the average consequences of a failed d20 roll? A failed attack roll is a lost opportunity. While your PC takes no damage and suffers no effects, failed attack rolls add up to a longer and more costly combat. Still, each individual failed attack roll does not carry large, direct consequences. A failed saving throw is generally pretty bad. A failed save against fireball for a 5th-level character costs costs an average of 14 hit points (28 damage average, save for half). 14 hit points is at least 25% and possibly more than 50% of a 5th-level character’s hit points. But on the other hand, the enemy that throws a fireball has expended a powerful resource at that level – a 3rd-level spell slot. A low initiative roll might mean taking damage that could have been prevented, but that’s not necessarily a clear, direct consequence. If those are our guidelines for the consequences of a failed skill or ability check, then we’re left with a pretty broad range – between indirect opportunity cost and 50% of your hit points! How does that help us? The answer is to consider the resource cost for the opposition. It costs an enemy nothing to stand there and have an armor class, so the consequences of failing to hit them are low. But it costs an enemy a 3rd-level spell slot to cast fireball, so the consequences of failing are high. Now if we imagine that the 5th-level PC fails a saving throw against a 1st-level spell slot (burning hands, to keep the fire theme) – they’re only losing about 5 hit points more on a failed save, which is down to less than 25% (possibly as low as 9%) of their hit points for the enemy’s 1st-level spell slot. If they’re attacked by an enemy cantrip, a save completely negates the effect. And there’s the rub with a skill check. If the source of the skill check costs the opposition nothing, then failing the skill check should be like failing an attack roll or a save against a cantrip – a low, indirect opportunity cost or a small number of hit points. That’s why high-stakes skill checks that involve jumping a chasm or finding a secret door that hides the major treasure feel so cheap – the chasm is just a chasm, not an opponent flinging high-level spells at you. For instance, let’s get back to Gimli. If the Dungeon Master in Gimli’s game has already established that one-off skill checks aren’t going to decide life-or-death consequences, then Gimli can fail the check without falling to his death. Perhaps instead, Gimli still crosses the gap, but only barely, resulting in the loss of some hit points (which we always need to remember are an abstract concept, not a count of how many pints of blood the character has left). In the movie, Gimli almost doesn’t make the jump, and he has to be grabbed by the beard by Legolas to be saved from falling. This is a pretty good way for Gimli’s DM to allow him to fail the roll without the consequence being a fall to his death. The drama and action of the scene remain (when we watch the movie, we know Gimli isn’t going to die on the bridge of Khazad-Dum, but it’s exciting tension nonetheless) without giving the PC a cheap shot of 20d6 falling damage. This isn’t the only way to handle jumping a chasm – the solutions to the Singular-But-Calamitous skill check problem are many-fold, and I plan to explore them through a series of posts about skill checks, but there are a few principles I think we can take away from this examination of d20 rolls and their outcomes. Never make any failed skill check more costly than a failed saving throw. Most failed skill checks should be as costly as a failed attack roll. Never let a single skill check be the difference between success and failure for the encounter, the adventure, or the campaign. A single skill check might occur at the climax of the story, but it should be a set of choices and strategies that make the difference between success and failure for the characters. There’s much more to come on this topic, so stay tuned! Update: The next essay, Why Do We Even Roll Skills?, has been posted.